Sleep pattern is closely associated with health and well-being. Emergent evidence indicates that both insufficient and excessive sleep durations are linked with poor physical and mental health [1-6]. In addition, a U-shaped relationship between sleep duration and mortality was found in many studies [7, 8]. Understanding the distribution of sleep duration and sleep patterns in a population is essential for health professionals to examine the sleep-related health problems and implement effective measures to improve unhealthy sleep habits. Population aging has been a growing health challenge worldwide, especially in developing countries, such as China [9, 10]. The Chinese Ministry of Civil Affairs reported that the number of elderly persons aged 60 years and above have reached 222 million in China, accounting for 16.1% of the whole population at the end of 2015 . Sleep problems including short and long sleep durations have been common in older adult population globally [1-6, 12]. In China, sleep patterns have been found to vary greatly across different studies [13-15]. One major reason is lack of gold standard criterion of short and long sleep duration. The recent recommendation made by the National Sleep Foundation suggested that different sleep durations are appropriate for different age groups . Older people aged 65 years and above were recommended to sleep 7-8 hours per day; less than 5 or more than 9 hours per day are not recommended . 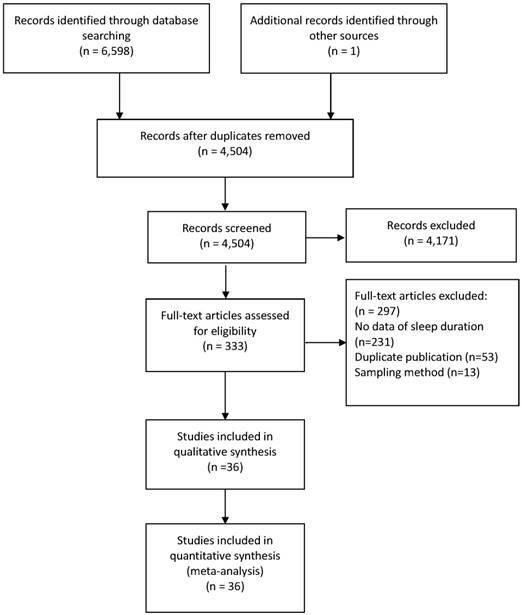 To the best of our knowledge, there have been no meta-analysis or systemic review of the sleep duration and patterns among older adults in China. The objective of this study was to summarize the data from observational studies and then estimate the mean sleep duration and proportion of short and long sleepers in Chinese older adult population. This meta-analysis was performed based on the Preferred Reporting Items for Systematic Reviews and Meta-Analyses (PRISMA) statement. 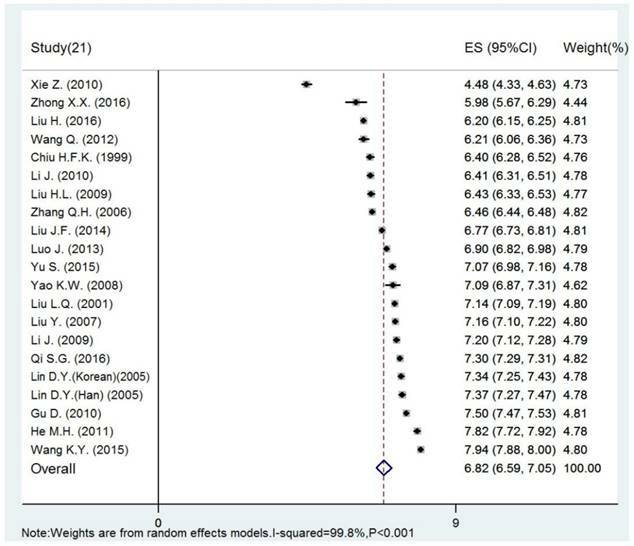 Two reviewers (LL and RWW) identified studies independently from PubMed, Embase, PsycINFO, Chinese National Knowledge Infrastructure(CNKI), WanFang, SinoMed from inception until September 10, 2016, using the search terms as follows: (sleep time OR sleep duration OR sleep habit OR sleep pattern OR insomnia OR sleep problem OR sleep disturbance OR sleep disorder OR sleep quality OR sleep symptom) AND (epidemiology OR cross-sectional study OR prevalence OR rate) AND (older adults OR elderly OR aged OR aging) AND (China OR Chinese). Additional studies were searched manually from the references of the selected publications. Studies that met the following criteria were included: a) cross-sectional or cohort studies conducted in China; b) sleep duration expressed as mean and standard deviation (SD) or as the proportion of short (<5 hours/day, <6 hours/day, or <7 hours/day) and long (>8 hours/day or >9 hours/day) sleep duration in adults aged ≥60 years according to the recommendation by the Chinese Ministry of Health; c) sample size ≥100; d) availability in full text in Chinese or English. For cohort studies, only the baseline data were extracted for analyses. Studies on special populations (e.g., army, retired people, empty nesters, people with major medical conditions) or specific settings (e.g., hospitals or nursing homes) and those using convenience sampling or without details on sampling process were excluded. Two reviewers (LL and RWW) screened titles and abstracts of the initial search results independently. If there were more than one article based on the same study, only the one with the largest sample size and complete information was included for analysis. Two reviewers (LL and RWW) conducted the data extraction independently. Disagreements emerged in the procedures were resolved by a discussion with a third reviewer (WSB). The following information was extracted and tabulated: study setting, sampling method, sample size, characteristics of the participants, and sleep duration with quantitative data. If there was more than one arm using different cut-offs of sleep duration in one study, then these arms were analyzed separately. The quality of included studies was assessed using the 22-item Strengthening the Reporting of Observational Studies in Epidemiology (STROBE) . In this meta-analysis, studies with a score of >11 were rated as “good quality” . The pooled mean of sleep duration, proportion of short and long sleep durations, and their 95% confidence intervals (CI) were calculated using random-effects models. The bedtime, sleep latency, time to go to bed and to get up were also pooled. Heterogeneity between studies was measured by I2 statistic; I2>50% was considered as high heterogeneity . Subgroup analyses were performed to explore possible sources of heterogeneity according to age groups (60~/70~/≥80 years old; for sleep duration only), gender, area (rural/urban), region (east, central and west parts of China according to the Chinese economic zone division), sample size and survey time (dichotomized using median splitting method). If there were more than 10 studies, meta-regression models were used to detect heterogeneity for continuous variables . Funnel plots, Begg's test  and Egger's regression model  were used to evaluate publication bias. Sensitivity analysis was carried out by removing each study individually to evaluate the consistency of the results. Comprehensive Meta-Analysis software version 2 (Biostat Inc., Englewood, New Jersey, USA) was used to perform the subgroup analyses and STATA version 12.0 (Stata Corporation, College Station, Texas, USA) was used to conduct other analyses. Significance level was set at 0.05 (two-tailed). A total of 6,598 potential papers were identified, of which 36 papers published in English (n=10) and Chinese (n=26) with 150,616 subjects met the selection criteria and were included for analyses (Figure 1). A total of 21 studies reported mean and SD of sleep duration, 22 studies reported the proportion of short sleepers (15 studies reported the data of sleeping <6 hours/day and 11 studies reported the data of sleep <7 hours/day) and 17 studies reported the proportion of long sleepers (10 studies reported the data of sleeping >8 hours/day and 9 studies reported the data of sleep >9 hours/day). One study provided data of Han and Korean Chinese separately, therefore we extracted and analyzed the data as two arms . Comprehensive characteristics of the eligible studies are shown in Table 1. The mean STROBE score of the studies was 18, ranging from 14 to 21. All studies were classified as good quality. Supplemental Figure 1 shows the funnel plot of the 21 studies with mean and SD of sleep duration, the Begg's (Z=-1.15, P=0.264) and Egger's tests (t=-0.44, 95%CI: -19.1-12.5, P=0.667) did not reveal any publication bias. Similarly, no publication bias was found in other meta-analyses (Table 2). The meta-analysis revealed that the mean sleep duration was 6.82 hours/day (95% CI: 6.59-7.05 hours/day) (Figure 2). The proportion of short and long sleepers are presented in Table 2. The proportion of short sleepers was 18.8% (95% CI: 1.7%-35.9%), 26.7% (95% CI: 19.7%-33.7%) and 42.3% (95% CI: 34.8%-49.8%), when defined as less than 5 hours/day, 6 hours/day and 7 hours/day, respectively. In contrast, the proportion of long sleepers was 22.6% (95% CI: 13.9%-31.4%) and 17.6% (95% CI: 12.4%-22.9%), when defined as more than 8 hours/day and 9 hours/day, respectively. NR=Not Reported; SD= Standard deviation; C; Chinese, E: English. >8 refers to that >8 hours/day and >9 refers to that >9 hours/day; TB=time to go to bed, SL=sleep latency, TG=time to get up, BT=bed time. Sampling Method: C=Cluster sampling; M=Multistage sampling; R=Random sampling; S=Stratified sampling; PPS=sampling with probability proportional to size. The results of subgroup analyses using mean sleep duration, the proportion of long (>9 hours/day) and short sleep (<6 hours/day) are shown in Table 3. The results using other cut-offs for sleep duration are shown in Table S2. The proportion of short sleepers (<6 hours/day) was 38.3% (95% CI: 20.7%-59.6%) in rural areas, while it was 17.0% (95% CI: 8.6%-30.8%) in urban areas, but the difference did not reach a significance level. Meta-regression analyses revealed that sample size and survey time did not have significant impact on the results (P>0.05). The pooled time to go to bed of 8 studies with 33,517 subjects was 09:03 pm (95% CI: 08:48 pm-09:18 pm). The pooled mean sleep latency of 6 studies with 31,107 subjects was 30.66 minutes (95% CI: 20.32 minutes - 41.00 minutes). The mean time to get up of 7 studies with 31,213 subjects was 05:24 am (95% CI: 04:58 am - 05:50 am) and the mean bedtime was 7.82 hours (95% CI: 7.43 hours - 8.21 hours) (Table S1). The time to go to bed for older adults in the east area was later than in the middle area (09:23 pm, 95% CI: 09:06 pm - 09:41 pm vs. 08:43 pm, 95% CI: 08:27 pm - 09:00 pm), but the former group had longer bedtime than the latter group (8.10 hours, 95% CI: 7.87 hours - 8.33 hours vs. 7.41 hours, 95% CI: 7.13 hours - 7.70 hours). Subgroup analyses of sleep habits are shown in the Table S3. After removing each study sequentially, the results from remained studies were still consistent with the primary results. In this meta-analysis, the pooled data of 21 studies showed that the mean sleep duration in Chinese older adults was 6.82 hours/day. In this group, 26.7% reported sleeping less than 6 hours and 17.6% sleeping more than 9 hours per day. On average, they went to bed at 09:03 pm and got up at 05:24 am. Their mean time spent in bed was 7.82 hours during which they needed 30.66 minutes to fall asleep. In terms of subgroup analysis, a greater proportion of older adults in rural areas had short sleep duration (<6 hours/day) than their urban counterparts. The mean sleep duration in this meta-analysis (6.82 hours/day) is shorter than the duration (7.5 hours/day) from another large survey of 15,638 older Chinese adults in 22 provinces , but is similar to that found in Europe (6.95 hours/day) . A multi-ethnic study on sleep duration showed that the proportions of short sleepers in white, black, Hispanic and Chinese people were 19.3%, 43.4%, 31.5% and 37.1%, respectively . Apart from the use of different definitions of short sleep, other factors, such as living rhythm, lifestyle, sleeping environment, chronic medical conditions, psychiatric disorders and outdoor activities, are significantly associated with sleep duration in older adults [24, 26]. China has been experiencing rapid urbanization and economic growth in the past decades, which may have a negative impact on the health of older adults . For example, increased consumption of stimulant drinks, such as tea, coffee and energy drinks, increasing nightlife and widespread use of electronic devices often interfere with 'circadian rhythm' including sleep pattern. However, the survey year of the included studies did not show a significant moderating effect on sleep duration in subgroup analysis. There is compelling evidence that short sleep duration could increase the risk of obesity, coronary heart disease, all-cause mortality, and was an important risk of non-successful aging [1, 5, 28, 29]. In contrast, long sleep duration was positively associated with cardiovascular diseases, stroke and mortality [1, 2, 4, 28]. Moreover, cognition and memory impairment were common in both short and long sleepers [3, 6, 30-32]. Previous studies found that low economic status is associated with greater sleep disturbance and short or long sleep duration [33, 34]. Considering that economic status is higher in the eastern region and urban areas than in the central region and rural areas in China, subgroup analyses were conducted between different areas defined by the Chinese economic zone. We found the proportion of short sleepers (<6 hours/day) in rural area (38.3%) was higher than in urban area (17.0%); the proportion in central region (35.9%) was higher than in the eastern region of China (19.0%), which support the association between economic status and sleep pattern. In addition, we found that Chinese older adults usually go to sleep almost an hour earlier than their counterparts in the USA, while the sleep latency of the Chinese old people were similar to those in the USA and Europe [24, 35]. The results should be interpreted with caution due to several limitations. First, inconsistent criteria were used in assessing the sleep duration across studies . Second, sleep data were self-reported which may lead to recall bias. Third, heterogeneity remained in the subgroup analyses, since heterogeneity cannot be avoided in large meta-analysis of epidemiological surveys [37-39]. In conclusion, short sleep duration is common in Chinese older adults. Given its adverse effects, effective measures should be implemented to improve the sleep patterns in this population. The study was supported by the University of Macau (SRG2014-00019-FHS; MYRG2015-00230-FHS; MYRG2016-00005-FHS). The University of Macau had no role in the study design, generating or interpreting the results and publication of the study. 11. Ministry of Civil Affairs of the People's Republic of China. Statistical Communique on Social Services Development. 2015.